Love Island fans are filling with excitement at the prospect of Danny Dyer making an appearance in the villa after he was spotted at an airport. A picture of the Eastenders star at an airport yesterday (July 22) was shared on Twitter, and ever since, Love Island fans have been speculating as to whether this means he’s going to visit his daughter, Dani, and her new boyfriend, Jack. Fans have been hoping for Danny to make an appearance on the show ever since Dani coupled up with Jack Fincham, curious as to how the man known for his ‘hard’ personality would treat the new man in his daughter’s life. The ‘meet the parents’ episode of the series is due to happen in the next week, and while Danny Dyer’s television commitments were leaving fans worried he wouldn’t make it, this recent picture has sparked fresh hope. In the snap, the soap star appears to be going through security, so there were no hints as to where he was actually heading. However, his appearance at the airport does seem to coincide well with the meet the parents episode. Understandably, fans are very excited at the prospect of Danny being reunited with daughter Dani, as well as meeting Jack for the first time. Danny has teased fans about going into the villa in the past, when it was revealed Dani’s boyfriend, Jack, was a fan of the Eastenders star. Jack also admitted on the ITV2 show, how he even used to have a poster of him on his bedroom wall. I’ve only gone and made the shortlist for the TV choice awards. If you fancy it whack a vote my way…..right…I’m off to the villa…to sign my future son in laws canvas….lovely. At least Danny seems to approve of his daughter’s choice of boyfriend, having referred to him as his ‘future son in law’ before even meeting him. Jack’s unshakeable commitment to Dani – including his nights spent sleeping outside Casa Amor – seem to have paid off. Danny’s wife, Jo, also revealed her husband is missing their daughter a lot while she’s been in the villa, so you never know! I think he’s a bit jealous, he does cry a lot. Every night. He really misses her. Jo also appeared on This Morning, and confirmed Danny approves of Jack. Danny really likes Jack. I think Danny, when he does meet Jack, he’ll probably cry. He’s really possessive. Message from our fashion partner @mennace_ltd: Whether you’re partying with your girlfriend, or out with the lads this weekend, visit Mennace.com to make sure you look the part! 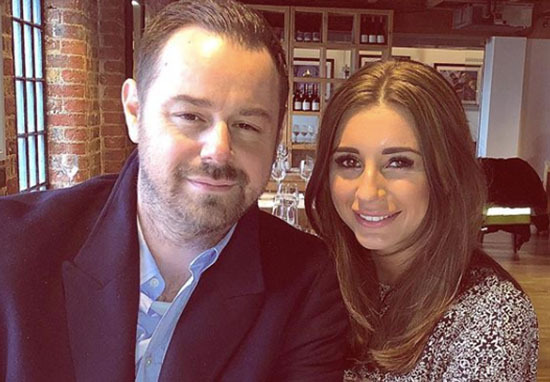 I think everyone would love to see Danny Dyer in tears, purely by the love of his daughter and her pen salesman boyfriend – it would certainly be a highlight of the series! Let’s hope the ‘meet the parents’ episode comes sooner rather than later!